Back-to-back 1-1 draws against Leicester and West Ham allowed Manchester City to briefly overtake the Reds at the top of the table before Saturday's 3-0 win over Bournemouth. "When people say he's nervous or we are nervous it couldn't be further from the truth. "In terms of the players we've not seen any difference in any of the staff and that feeds into the players and we've not changed - whether we draw, win or lose it doesn't change. "If we have a bad result we use that to put in a positive performance for the next game and that's what we've done. "Since Monday at West Ham we've studied this Bournemouth game. "We wanted a clean sheet and we wanted to get some goals and it could have been a lot more than 3-0." 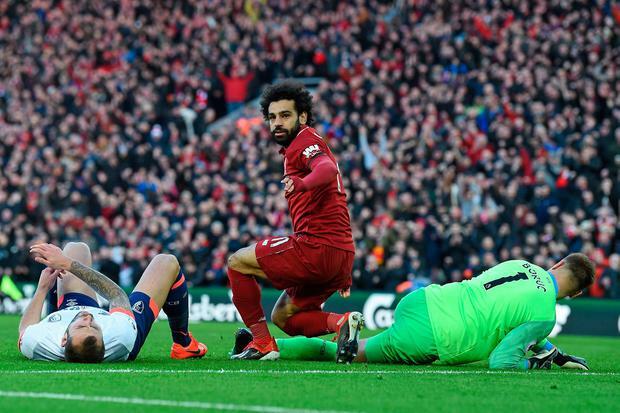 The performance against a Bournemouth side, who have now lost nine away matches in succession and have 13 defeats in the last 18 matches in all competitions, showed a return to the high-energy pressing game and clinical counter-attacking which has been so successful for Liverpool. It means Liverpool fly to Marbella today for warm weather training with their season firmly back on track. "I don't think it's a message to any other team or anything," said Robertson. "It's maybe a message to our fans and everyone connected to the club that we're here. We fought for everything and got the result that we needed."